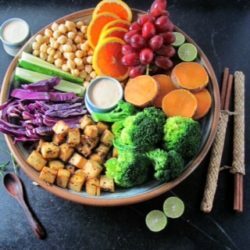 Glazed Tofu Bowls with Tahini Lime Sauce: Tofu is crispy, sticky, tasty, and healthy. Sauce is perfect. Vegan and gluten free. 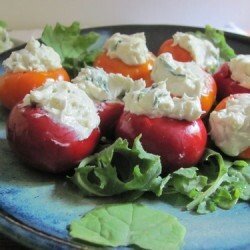 Blue Cheese Stuffed Pepper Bombs: 3 ingredients, no cook, make ahead! Sweet, savory, salty, tangy, creamy bites. 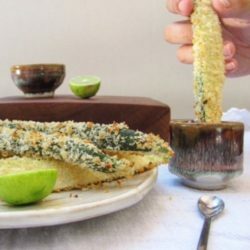 The crispy, crunchy, tasty, best baked Zuccini Fries ever. 6 ingredients, 7 sauces, 15 minutes. 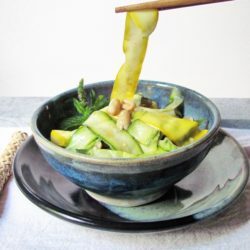 Epic Thai Peanut Zucchini Noodles: Wide Ribbons of Zucchini that will satisfy your pasta craving; easy, healthy, sweet/spicy peanut sauce. 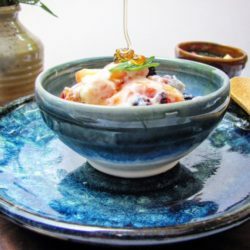 Honey Lavender Lightly Frozen Yogurt with Fruit: How to make your yogurt Greek and lots of low fat, healthy, gluten free, easy ways to enjoy it! Your new go-to fave, easy, moist, low fat, scrumptious! 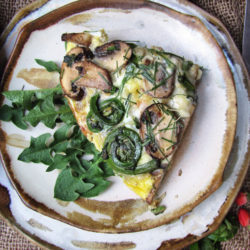 A cross between a frittata and a quiche, this GF Fern Pie may be made with fiddleheads or asparagus-celebrate spring. 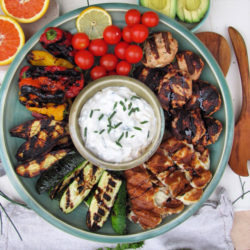 A great big platter of grilled vegetables and turkey kofta surround creamy tzatziki sauce. 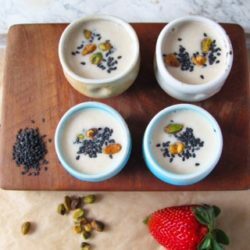 Coconut and sesame combine to make these easy,fun Smoothie Shots; perfect for a party, snack, breakfast or lunch. Dip fruit or make bowls. 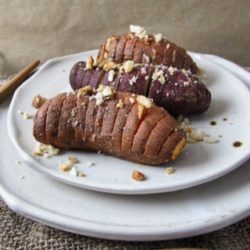 These healthy, vegan and GF Hasselback Sweet Potatoes are pretty, fun, quick, easy and YUM! 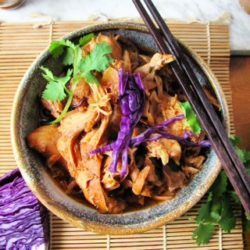 Slow Cooker Honey Soy Pulled Chicken. So easy. So flavorful. Versatile. Gluten free, low carb, healthy. It will be your new fave! 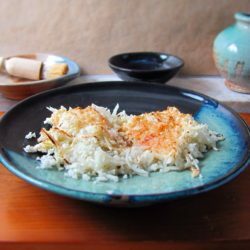 3 ingredients, 30 minutes, these baked Cauliflower Hash Browns are easier and better than cauliflower rice. 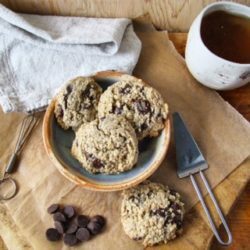 These homey, yet unusual oatmeal cookies are chock full of yummy goodies. Make them ahead and freeze; bake as needed. 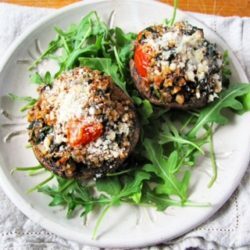 Spinach, tomato, parm stuffed mushrooms are hearty, flavorful, and classy. Gluten free and vegetarian, they are a perfect appetizer or side. 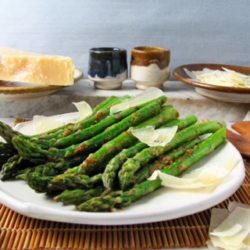 20 minutes, 4 ingredients, these roasted Umami Bomb Asparagus are so good it’s unfair to all other vegetable recipes! 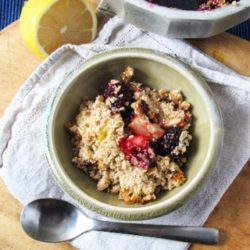 An easy, delicious apple, berry, oat, nut crumble. 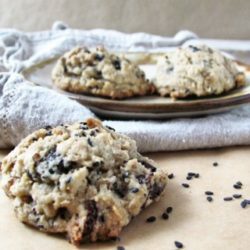 Gluten free, vegan and irresistible! 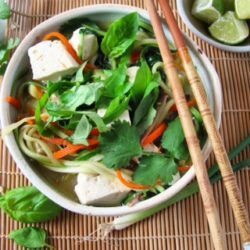 Thai inspired Coconut Chicken Soup is loaded with veggie “noodles” and herbs. 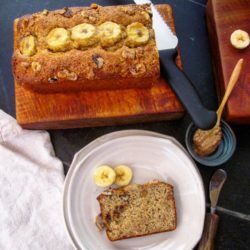 Comforting and exotic, you can put it together in 30 minutes! 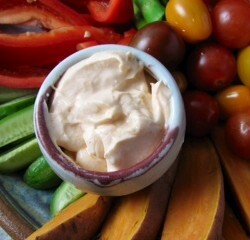 Spicy, sweet, tangy sauce, 7 ingredients, no cook, good on veggies, poultry, seafood, meat, chips, sandwiches, or you valentine! 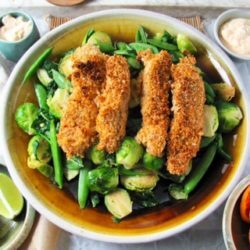 Perfectly season tender inside, crunchy and flavorful outside, these chicken fingers will be a huge hit with children of any age! 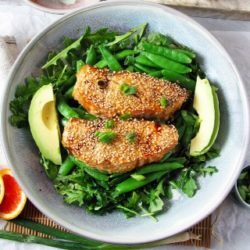 Easy and elegant, this scrumptious salmon has a crisp, sticky crust, buttery, silky flesh and a sweet-tangy ginger, soy, sesame glaze. Popular with gf and non gf cookie monsters alike, this easy, heavenly treat has no weird ingredients. 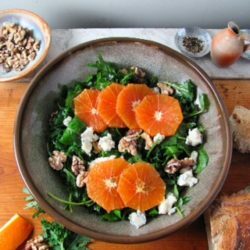 Surprising for two reasons, this beautiful, delicious salad is quick and healthy! 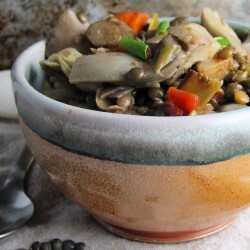 Easy, hearty, quick, packed with protein, and vegan, this lentil stew is a winner! 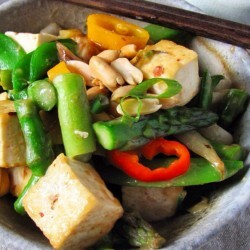 This easy, fast stir fry has surprises that make it different from your usual! Yup, it’s totally addictive. 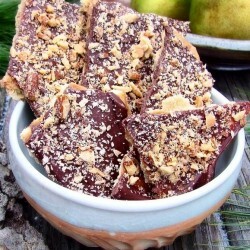 a purely wicked treat that is easy to make and will cause extreme popularity. 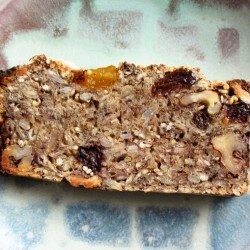 Cultivate your awareness of healthy, delicious eating with this organic, whole grain, nut, seed and fruit bread. Gluten free and vegan! 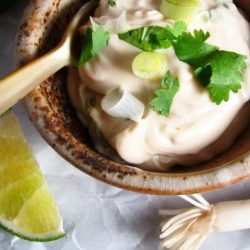 This 6 ingredient sauce rocks! It tastes good on just about anthing! 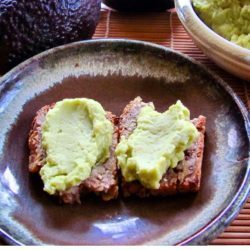 Hybrid of hummus and guacamole-4 ingredients, perfect for the big game or your next party! 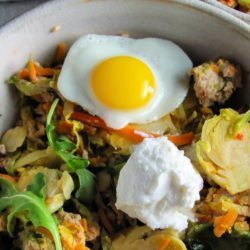 Colorful veggie hash, make it with or without meat. Perfect for a cold winter night! 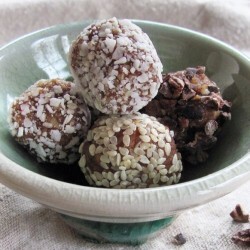 Raw, vegan, gf and delicious, these treats will give you a reason to count your blessings! 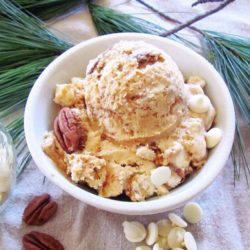 White Chocolate Salted Caramel Pecan Ice Cream. No machine! Heaven in a bowl! 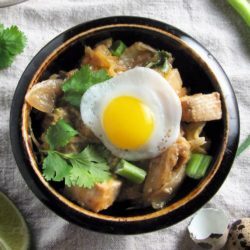 Delicious, low carb, gluten free pad thai!